During the last week my oven has seen two batches of freshly baked bread, and they were really delicious so I wanted to share them with you guys. The first batch of bread I baked was rustic rosemary and garlic bread from Amanda’s cookin’ using rosemary from my garden. I wish I had taken photographs but it was so yummy that it was eaten before I got chance to get my camera out. I followed the recipe almost exactly, I used bread machine yeast rather than SAF and I mixed and kneaded it lightly by hand rather than using a food processor. For the first rise I left the dough under my radiator for about two and a half hours, by which time it had more than doubled in size and smelled fantastic. 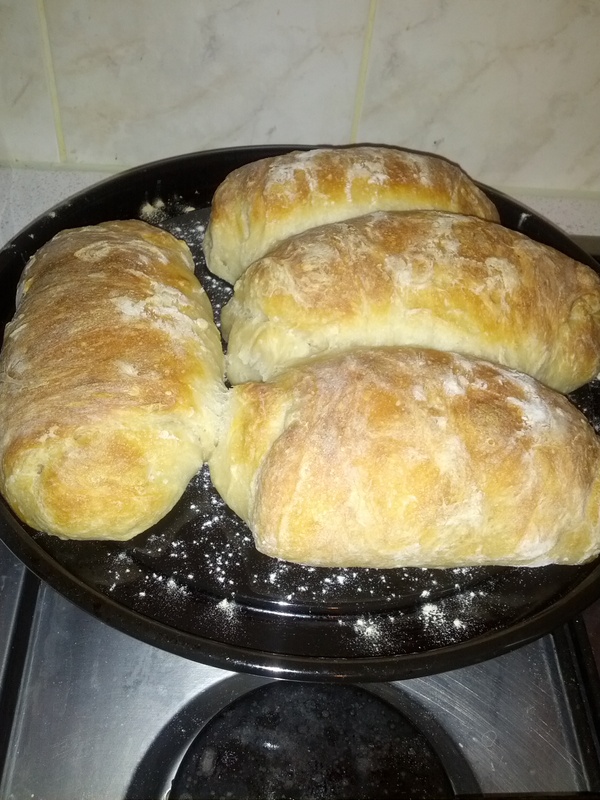 I shaped the loaves as described and left them for a second rise, which I rushed. I wish I had left them long enough to double again, but we were hungry and I baked them a little too soon. The bread tasted amazing but it was a little dense. My second batch was French baguette from them apples. Sadly I don’t own an oven tray large enough to fit baguettes on, so as the recipe suggests, I stopped at the batard stage and baked what looked like blobs. I also forgot to slash the tops which probably added to the blob-ness. Also, again due to lacking appropriate ovenware, I don’t think I got enough steam in the oven when I added the bread. My loaves seemed very crusty when I took them out the oven, but as they cooled the crusty-ness diminished. Nevertheless, the bread was delicious. It was quite crusty, fluffy and light inside, and went very well with the butternut squash soup I paired it with. I have two loaves in the cupboard waiting to become garlic bruschetta which I’m very much looking forward to. 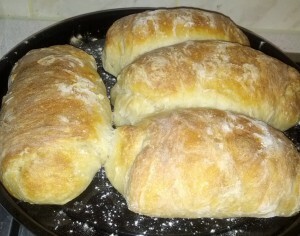 I am also dying to try the no knead bread from steamy kitchen but I don’t own a cast iron casserole. I have my eye on a lovely blue one from Le Creuset but my budget won’t stretch that far just yet. As soon as I get my hands on one, bread will definitely be the first thing I make in it.